The first screening of The Tangled Sky was took place during WRO Media Art Biennial 2001. 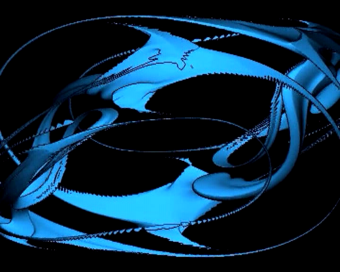 The Tangled Sky is an expermental, generative computer animation based on fractal theory and 4-dimensional geometry. 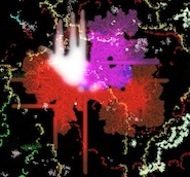 The final form of The Tangled Sky is a result of long-term (about 3 - 4 months) computational process shared and networked between many computers. This animation was intended to be the realization of an idea, which then occupied me: I wanted to create a visible representation of the four-dimensional (or rather difficult to directly experience) space and objects. I soon found that the rules (linear perspective) governing the conversion of three-dimensional space to a two-dimensional surface can be easily converted into rules to convert the four-dimensional to three-dimensional space (and this can be reduced to a two-dimensional surface). However, it did not have the right, ready-made tools, so I had to write the necessary software (as I remember I was under strong influence of activities by artists such as Zbig Rybczynski and Yoshiyuki Abe, working, among other things, with custom-made software). Unfortunately, it turned out that the finished program was running extremely slow and calculations required to produce the whole animation would require many years of relentless work computer that is then used. For a while I was wondering how this program to solve. Finally, I got the idea to write a computer virus that will be sent out on the network and calculate fragments of the animations on infected computers (and, of course, will send me the results). Network security was then (2000 - 2001) at a much lower level than it is now and, although with some difficulty, but I was able to create such a virus and infect the a local network in one of the institutions located in my city. In retrospect, it seems to me that this particular method of obtaining visual material was more important than the final result. Exploiting existing medium, bypassing my own and budgetary restrictions - all this was possible thanks to custom computer programming. Today, as more and more artists using ready-made ​​tools (including software) and avoid direct confrontation with the technology, the strategy used to create The Tangled Sky seems to me to be particularly important.